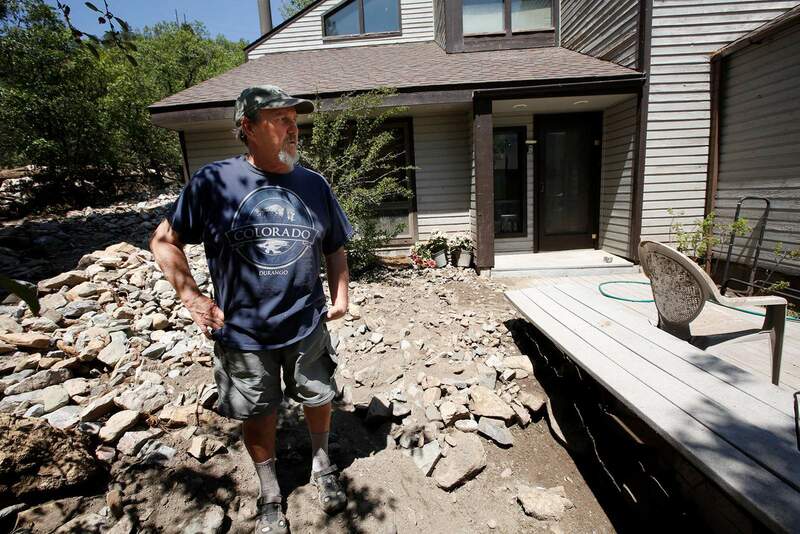 Gene Vanderbur stands near the second story of his townhome on Monday after a rainstorm July 24 filled the ground level floor inside his home with mud, rock and debris that is over 6 feet deep. Vanderbur lives at The Pines Townhomes north of Hermosa. He and his wife, Marjorie, were out of town when the floods hit. HERMOSA – The weather Monday morning was sunny and calm, with no monsoonal thunderstorms in the forecast. Looking east across the Animas Valley, observers would think that nothing ever happened. But on the west side of the valley, Gene and Marjorie Vanderbur’s home is filled with mud 6 feet high. In their backyard, the hillside has moved so much that the second floor’s deck almost feels like it is the first floor. 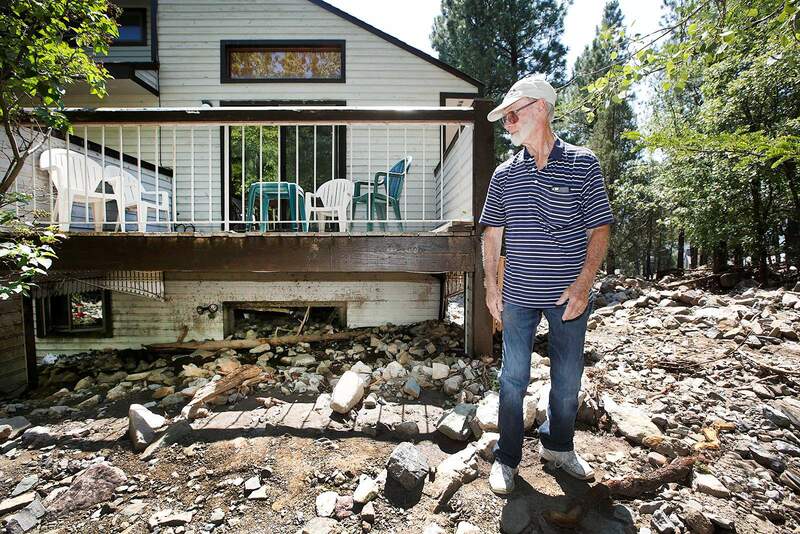 The Vanderburs, who live at The Pines Townhomes, were hit hard July 24 by flash floods and debris flows. Immediately south of their house lies a river of mud, logs and large boulders that is several feet deep. To make matters worse, debris precariously sits on the burned hillside above the homes, just waiting until the next big rainstorm hits for it to rush downhill and create more havoc. For the Vanderburs and residents near the 416 Fire burn scar, this is their new reality for the long term, officials say. Larry Bareis, treasurer of The Pines Townhomes Homeowners Association and whose house was spared major damage from the last round of floods, said one company estimated it would cost $50,000 to clean up the debris. However, the HOA is running low on money after cleaning up the debris that had blocked the road. A fire hydrant at The Pines Townhomes north of Hermosa somehow still stands Monday after being pummeled by rocks and mud during a rainstorm July 24. Bareis hopes to organize a community meeting for area residents to take their concerns to local and state officials. He said meeting requests have been sent to everyone from county commissioners to the governor’s office. “I want all of Hermosa to be there,” he said, noting that everybody downhill from the burn scar is in some type of danger. Bareis is frustrated because no assistance has been offered from La Plata County or other governmental agencies. “They (the county) haven’t helped at all – not even a sandbag,” he said. He said insurance assessors and the Natural Resources Conservation Service have been working in the area, but there has not been short-term help – financial or otherwise. Trucks hauled out about 40 loads of mud and debris just to open the road in The Pines Townhomes north of Hermosa. Flooding and mudslides occurred July 24 after a heavy rainstorm. The adjacent land was burned in the 416 Fire, making the terrain unable to absorb moisture when it rains. 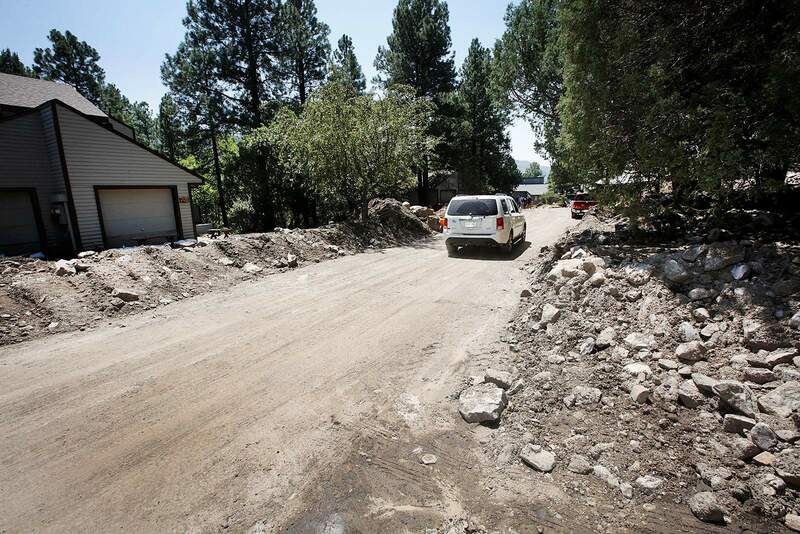 The county is not responsible or obligated to assist in repairing damage to private property, county spokeswoman Megan Graham told The Durango Herald on Monday. “Certainly, we understand how upsetting and inconvenient it is to have these impacts,” she said. The county is working with the NRCS to provide resources to private property owners. For example, the NRCS Emergency Watershed Protection Program can help with erosion, flood mitigation and repair work on private property. The NRCS has been surveying damage, but no programs have yet been opened to the public, Graham said. 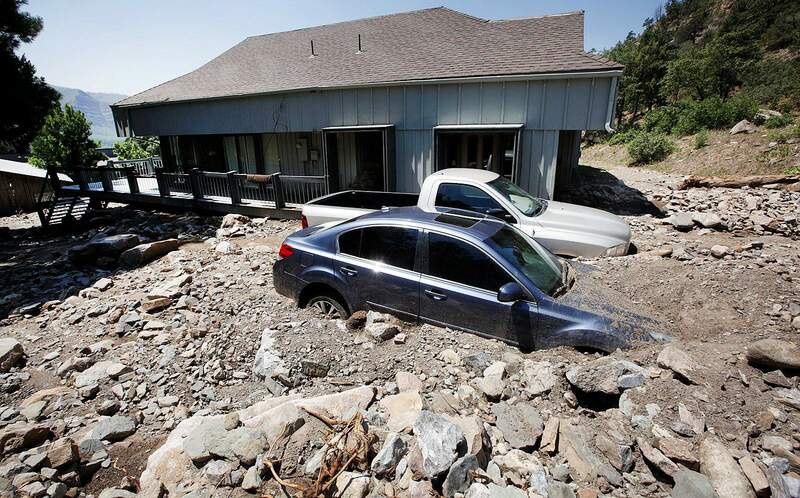 Vehicles at Mel Smith’s home, which is situated in between The Pines Townhomes and Animas Village Apartments north of Hermosa, were buried in rock and debris after a heavy rainstorm July 24. The adjacent land was burned in the 416 Fire, making the terrain unable to absorb moisture when it rains. The Vanderburs live in Durango part time. When the flood hit, they were in Phoenix, Marjorie Bareis said. Currently, they are living with their neighbor as they search for a contractor to start cleaning their home. They would like to see some sort of government assistance identified through Bareis’ initiative. “We just don’t know where to start,” she said. A slight distance to the north of Bareis’ home are the Pine Acres condominiums, where all but one of the bottom floor units sustained flood damage. In between the hillside and the 15 damaged units, a ditch is being dug and dangerous trees removed. Like their neighbors, the residents are concerned about what officials are saying – that more flooding is not an “if” but a “when” issue, said Kristin Hoff, interim Pine Acres Homeowners Association president. Larry Bareis, treasurer of The Pines Townhomes Homeowners Association, looks over tons of rock and debris at the development north of Hermosa on Monday. The flooding and mudslides occurred July 24. The adjacent land was burned in the 416 Fire, making the terrain unable to absorb moisture when it rains. Bareis has been organizing cleanup and services for the small development. Hoff said that the units at Pine Acres are all individually owned. She said that homeowners’ insurance policies do not cover flood damage. She said the best-case scenario would be to receive county or federal funding to help with water and debris-flow mitigation. She said the HOA will pay only as a last resort. Across the stream of boulders from the Vanderburs is the home of Mel Smith, which is not part of The Pines Townhomes’ HOA. The Smiths are elderly, do not have much money, and their driveway is still blocked by hundreds of boulders and rocks. The Smith and Vanderbur homes are but two monumental tasks ahead among many more in the neighborhood. “Someone’s got to help,” Bareis said. rsimonovich@durangoherald.comAn earlier version of this story misspelled Kristin Hoff’s first name. 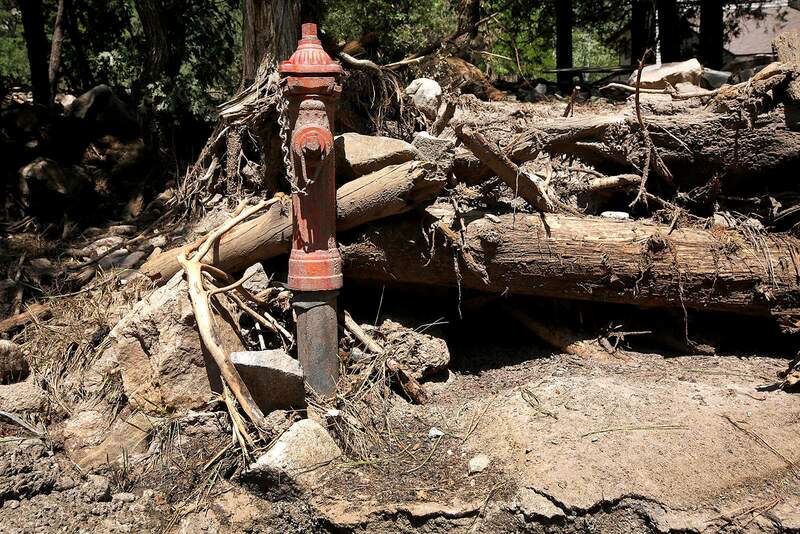 La Plata County has several links to documents about floods after wildfires, including the Burned Area Emergency Response team summary of the 416 Fire, debris flow probability map, soil burn severity map and much more. For more information, visit https://bit.ly/2LA3PvR.The U.S. Department of Agriculture’s Emergency Watershed Protection Program provides assistance to residents whose property has sustained damage from natural disasters, including flooding after a wildfire. For more information, visit https://bit.ly/2iKDah0.